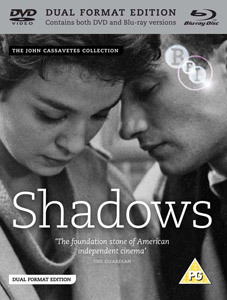 Five films by American filmmaker John Cassavetes – the spiritual father of the independent film scene – will have their worldwide Blu-ray premiere this year, with the release of Dual Format Editions (containing DVD and Blu-ray discs) by the BFI. 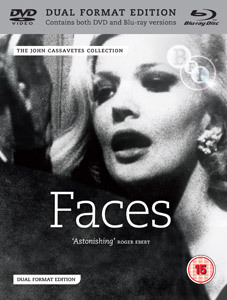 The John Cassavetes Collection is launched on 23rd April with his ground-breaking 1959 debut feature Shadows and his 1968 film Faces starring Gena Rowlands. Cassavetes' first film charts the doomed relationship between a young mixed-race woman Lelia (Lelia Goldoni) and Tony (Anthony Ray), a white man who betrays his prejudice when he meets Lelia's brother, a struggling jazz singer. Shot on location with a cast and crew largely made up of amateurs Shadows features a swinging, improvised score by Charlie Mingus and Shafi Hadi, and is considered to be the first truly independent American film. 32-page illustrated booklet featuring new essays and notes from Michael Atkinson, Brian Morton and Tom Charity. Shot in searing, high-contrast black and white 16mm, Cassavetes dissects the suffocating world of middle-class Los Angeles where hollow laughter and drunken frivolities mask loneliness and social alienation. Nominated for 3 Oscars – an unheard-of achievement for an independent film at the time – Faces employs a freewheeling, realist approach, and showcases some of the finest performances ever seen in American cinema. 32-page illustrated booklet featuring interviews and new essays from Tom Charity and Al Ruban. John Cassavetes' three mid-1970s features A Woman Under the Influence (1974), The Killing of a Chinese Bookie (1976) and Opening Night (1977) will be released in Dual Format later in 2012. More detailed packshots will be posted when we get them.